Saturday 30th July 2016 - Very Hot and Sunny - over 30 degrees all day and into the night. 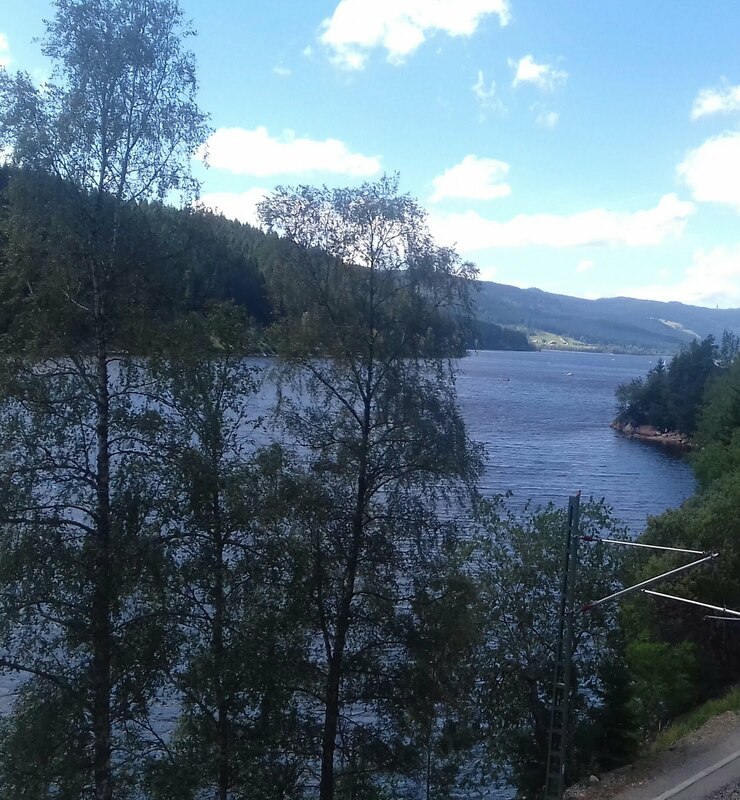 This morning we left our camp site at Lake Titisee and headed for another lake - this time the very beautiful Lake Schluchsee, and to get there we passed through more dramatic areas of the Black Forest. When we arrived the area was very busy with bikers, hikers, boaters and strollers, and although we did manage to park, it was with a high risk of becoming blocked in. So it was with fingers crossed that we went for a walk along the banks of the lake, and it would seem that we timed our return just right, because one car had parked up within about a foot of the right side of the van and another was attempting to squeeze in almost as tightly on the other side - but we just managed to nip out before the 2nd car got settled. But by now we were starving so it was a quick trip down the road where we soon found a quieter picnic area for our lunch, however because we knew we were headed for another busy tourist area and because it was weekend we decided to head on towards our destination to ensure we got a parking spot on the Stellplatze there, and once again we were lucky enough to slip into the next but last available gap. 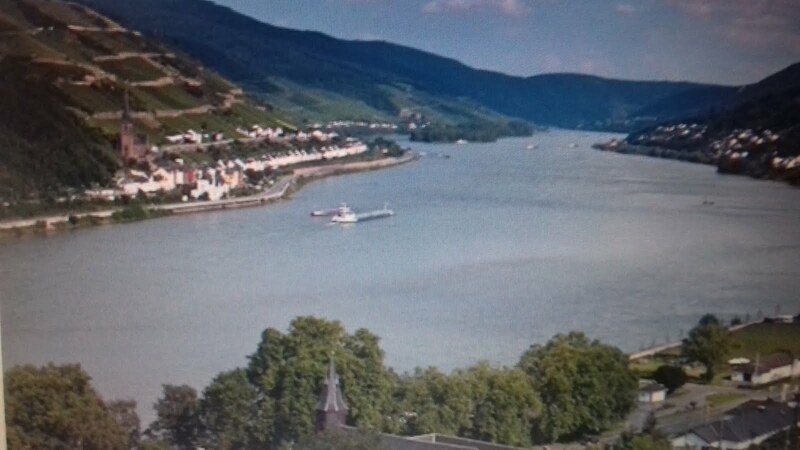 The Stellplatze is new and modern and almost right on the edge of the Mighty Rhine, and that’s the reason we chose this area - we plan to stay a couple of days and hopefully cycle along the river side tomorrow. However, we still had the rest of today to fill first, so in the late afternoon we walked along the river side to the nearby town of Waldshut - where we found a busy main street with lots of people enjoying their evening in the numerous street cafes and lots of children cooling of in several pretty little fountains. Then it was back to T4rdis2 where we whiled away our evening sitting outside with many other like minded travellers sipping a cool drink and watching for the stars as they popped out in a clear dark sky. Sunday 31st July 2016 - Torrential downpours and occasional rumbles of thunder - but cooler - only 26 degrees today! This morning we got up and donned our bike gear ready for our planned ride - however, the rain very quickly put paid to that! 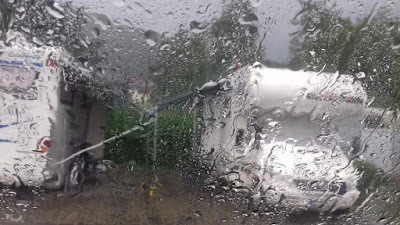 The first downpour arrived while we were eating our breakfast, and throughout the day the rain has 'pissisted' with dramatic intensity, thus resulting in the postponement of our ride until tomorrow when Mrs Sun is forecast to return. So today we've just spent our time planning our ongoing journey, and generally doing not much else at all - hopefully tomorrow will see the resumption of normal activities, but if not, I think we might both develop a severe form of 'cabin fever'. Oh, and did I mention the LEAKS in T4rdis2's roof - all our fault and caused by left open sky-lights - we ended up with 3 big puddles to mop up! I didn’t think I would have anything else to tell you about today, but as the evening wore on we heard a strange and eerie noise that was obviously being produced by some sort of instrument quite near by. We stepped out to investigate and found a Swiss couple playing their Alphorns - we would never have guessed that was what the sound was. 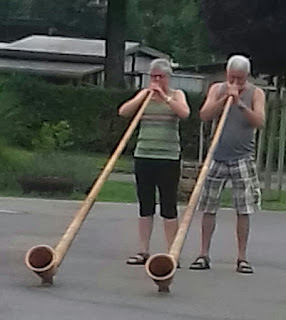 A small crowd soon gathered to listen to this strange music and this encouraged the players to continue and they completed their repertoire by playing a piece of music with one pipe that was then echoed by the other. It truly was quite haunting and it must be fantastic to hear them when they reverberate through the Swiss mountains. Monday 1st August 2016. A lovely bright warm sunny day. The day dawned perfect for our bike ride, so we were soon up dressed and ready to go, however we didn’t get quite what we'd bargained for. We thought the track we planned to follow would closely shadow the twists and turns of the Rhine, but for the first half of our ride our view was obscured by trees and shrubbery. However, the second half mostly made up for it, but we never did quite reach our planned goal - the town of Bad Sackingen, because that would have made our ride over 70 kilometres which was a bit to far in the heat of the day. 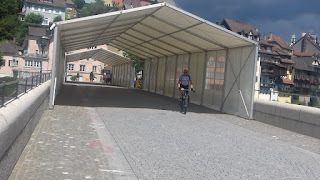 So when we arrived in Laufenburg we decided that was far enough, and anyway, from there we felt the need to cross over the border into Switzerland. 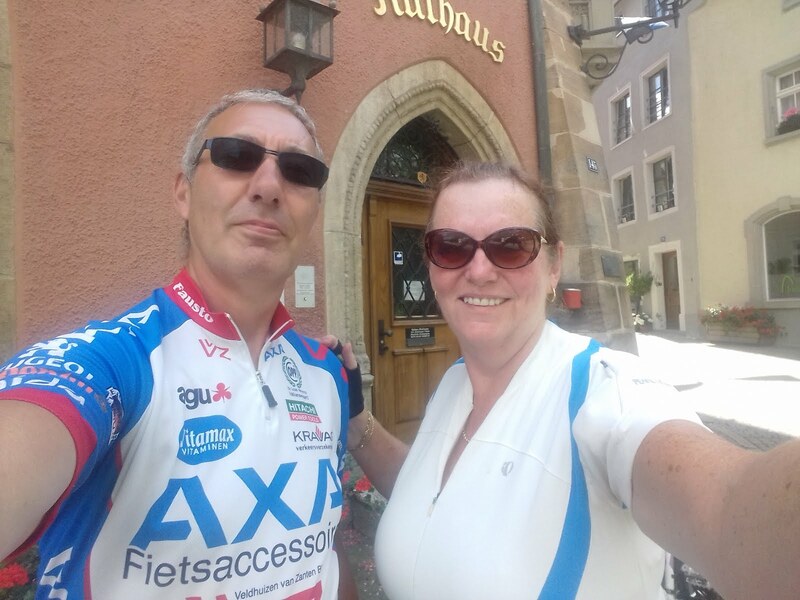 Then it was back through the very pretty cobbled streets of Laufenburg where we stopped to chat with a Swiss couple who were cycle touring. They'd started from St Moritz a week ago and were heading for Lake Constance which will also be our next destination We couldn't quite decide if there bikes were electric or not, but with the very heavy looking loads they were carrying they were doing very well if the only power they had to rely on was peddle! By the time we set off back dark clouds were looming again and we did think we were in for a soaking, but happily not, it just all seemed to blow over into Switzerland! 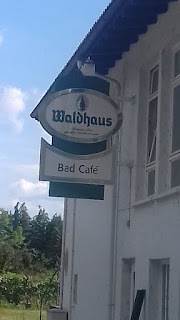 And then as we neared home we did consider stopping at a cafe for coffee - but the sign kinda put us off! 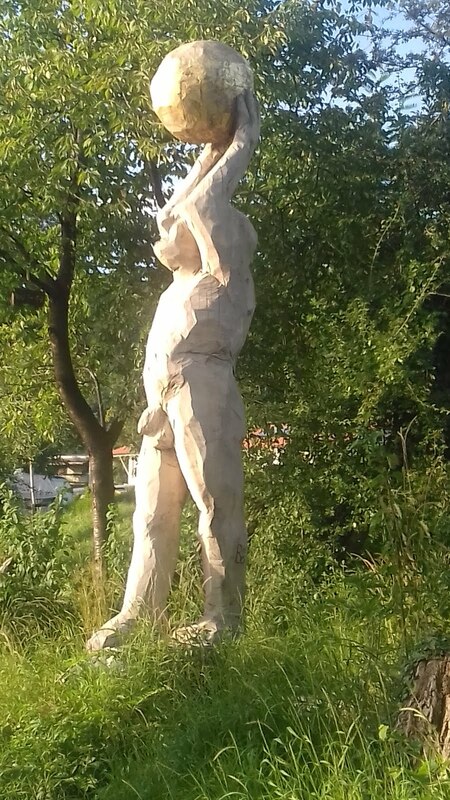 Then finally, after very welcome showers in T4rdis2's very efficient bathroom, we went for a short stroll along the river back to see some wood sculptures that we'd been told about. I think maybe he could have done with the leaves leaving on! Tuesday 2nd August 2016 - Another hot humid day with just a sprinkle of drizzle in the evening. This morning we left the Stellplatze at Waldshut and headed towards Lake Konstanz where we planned to stay for the next few days, and on the way we did some shopping in what is fast becoming my new favourite supermarket - Netto - it does one good to have a change! 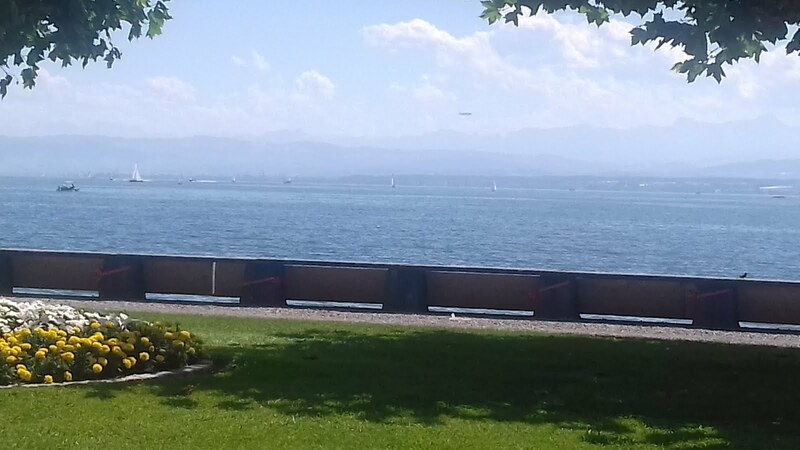 Lake Constance (or Bodensee as it is called in Germany) lies on the border of Germany, Switzerland and Austria, it is 15km (9 miles) across, 63kms (39 miles) long and apparently, it reaches a depth of 252 metres (826 feet), thus making it the second largest lake in Western Europe - the first being lake Geneva. Also, because of the earth’s curvature, you can’t see from one end of it to the other, and according to Archimedes Principle, if all the people on this planet went for a swim in it the level of the water would only rise by 10 centimetres! The lake is surrounded by about 270kms of cycle track, and our object in coming here was to ride along some of it that is within Germany, but it seems that many hundreds of people of numerous nationalities also had the same idea. And that’s caused us a bit of a problem because we hadn’t booked anywhere to stay! We arrived in the area at about 1.30 and headed initially for a couple of Stellplatze that John had identified from our Bord Atlas, but they proved unsuitable either because they were full or in very busy areas. That only left one on his list, and it was in a less favourable spot, but when we arrived there was plenty of space, therefore it was quite a relief to get parked up and make it our home for the night. Oh well, we thought, we’ll check out a couple of the campsites and move in the morning, so after a late lunch we set off walking too 2 that were quite nearby - to say the least, they proved to be ‘over populated’- you could hardly have squeezed a lettuce leaf between the vans or tents and they were of quite a scruffy appearance. Now, we’re not usually fussy, but staying was completely out of the question, especially as they were mega expensive! 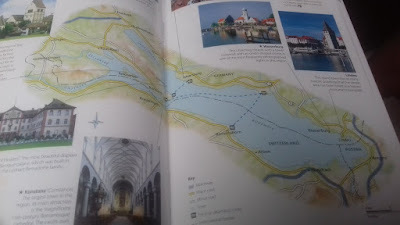 Therefore, when we got home it was back to the Bord Atlas, and we spotted another Stellplatze on the opposite side of the water at a place called Uberlingen so we’ll keep our fingers crossed and check it out tomorrow. After breakfast, off we trundled to Uberlingen to what proved to be a perfect site for us to spend the next few days. It’s just another Stellplatze but it has spacious pitches, it’s got electric hook up and the people are friendly - what more could we ask - oh and it’s only 10 euros a night! We soon got settled, and after chatting with the neighbours for a while we set off to walk down into the town to do a bit of exploring. We took our lunch with us and sat at the side of the water nibbling our sarnies while people watching in the lovely flower filled park. Then eventually we sauntered back to T4rdis2 and spent the late afternoon sunbathing and sipping one of Germany’s fine black beers. Well today was the day - our bikes were out and we were soon off to cover 55kms in all. As you would imagine, with it being main holiday season, the track was very busy, and although it was fairly wide the constant two way cycle traffic and the occasional cars that were trying to find lake side parking did detract slightly from the pleasure of the ride. 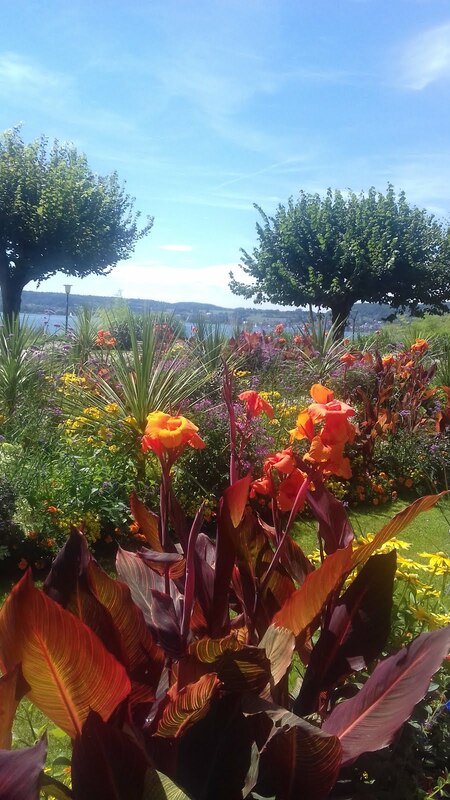 Having said that, for most of the time we had lovely lake views on one side and vine clad hills on the other, and additionally, we got to see the lovely little towns of Oberuhldingen, Meersburg where the ferry terminal is, and finally Fischbach from where we decided to turn back. It was here that we spotted a ‘Zeppelin’ floating high above us, and if we’d had the energy to continue, we would have eventually come to Friedrichshafen which is famed for it’s Zeppelin Museum. 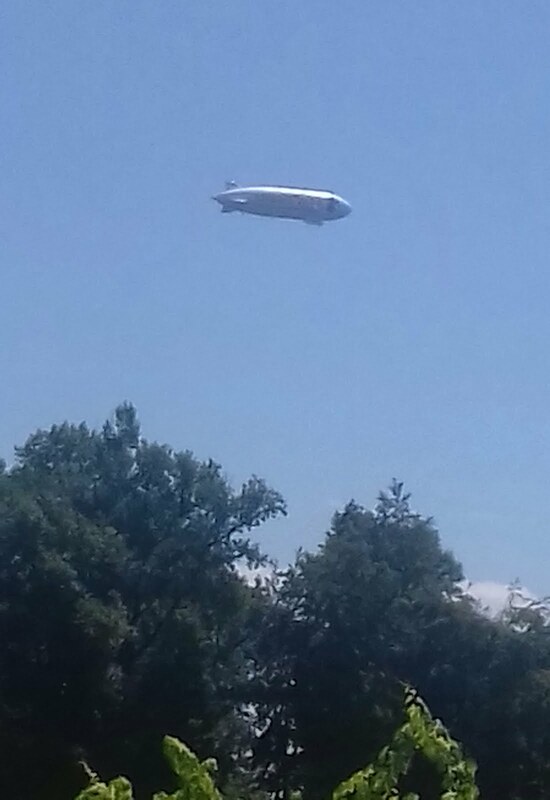 It was here that Graf Ferdinand Von Zeppelin developed and built his famous airships in the early 20th century, and where similar smaller airships are still made today. However, next on our agenda was finding our lunch stop, and this turned out to be Uferpark in Hagnau - another flower filled oasis, and a place from where we could see the Bavarian Alps in the distance and watch the Zeppelin continue it’s journey over the lake. Then it was back to T4rdis2 to put our feet up and enjoy the evening sunshine with another cold black beer. However, at about 7pm this was cut short short when the sun vanished, the wind picked up and thunder claps filled the air. From then on the heavy rain clattered noisily on the roof for the rest of the evening and for a good part of the night - and when that roof is only 3 feet above your bed - it didn’t make for a peaceful nights sleep. Friday 5th August 2016. Dull, drizzly and cold - only 18 degrees! This morning we were both a little the worse for were after our poor night’s sleep and we didn’t get up until nearly 9am! We had thought we might go out on our bikes again but the drizzly weather and our weariness has quite put us off, and it’s cold - we’ve both put jumpers on for the first time in ages! Maybe,if it brightens up we might walk down onto the water front later. For now we are having a lazy morning watching the comings and goings of lots of vans around us, and I’m trying to put my blog to rights and get it posted. 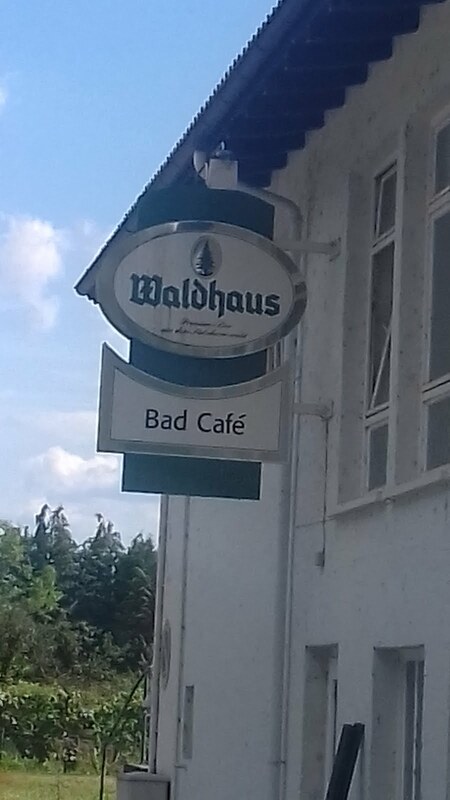 However, our plans to obtain Wifi have been scuppered again, and as Germany isn’t a ‘3 Feel At Home’ country 3’s service costs 3.9p per mb - which works out at a mega £40 per GB. So I’d brought a German sim card which would only cost 9 euros per GB, however to activate it you need a permanent German address so it proved to be useless - has anybody got any advise!